It is a period of civil war. The galaxy is a tinderbox, simply waiting for the spark of rebellion to ignite war across countless planets. 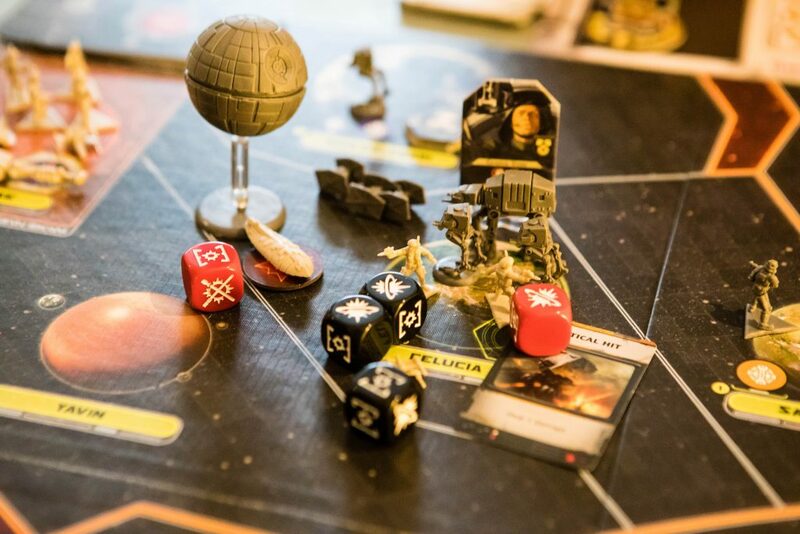 And Star Wars Rebellion, from Fantasy Flight Games (FFG), is exactly that spark, playing out the cat and mouse struggle between the Empire and the Rebellion on your dining room table in an endlessly quotable explosion of plastic and cardboard. … I mean, you’ve heard of this game, right? 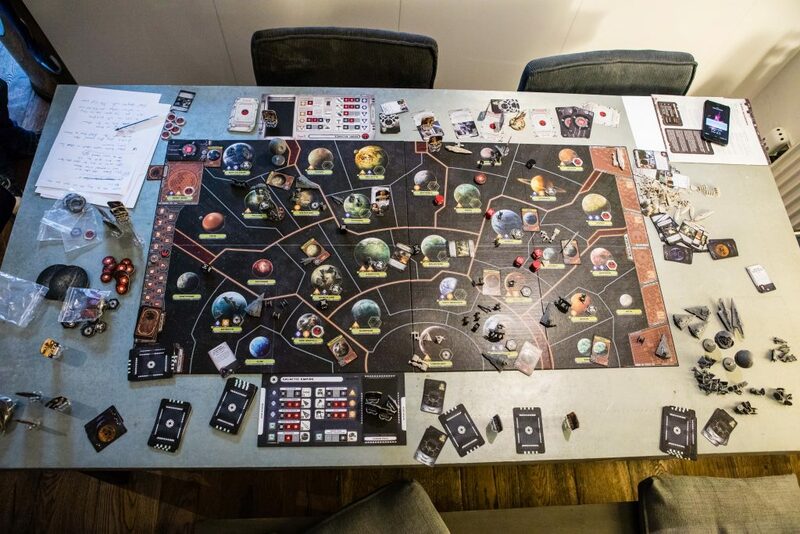 Star Wars Rebellion is one of the poster children of modern board game excess, spewing fistfuls of iconic plastic miniatures out across your table as you set up not one but TWO full size boards across which you will wage your campaigns for a galaxy far far away. It’s big. It’s heavy. It wants you to spend nearly a hundred quid on something you can only really enjoy with one other person at a time, and it wants several hours of your time to do so. It’s the prog rock of board gaming. If you like Star Wars, you’re on to the right track. If you’re a Star Wars fan who also enjoys tactically dense, deeply evocative games with high production values then you’re on to a winner. On paper, the broad shape of the gameplay is relatively simple. 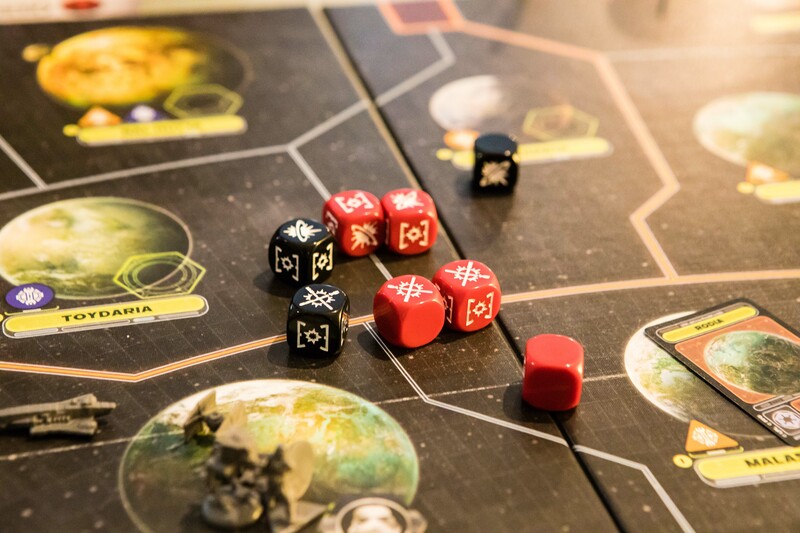 Players take turns sending their leaders (characters from the films and expanded universe) across the galaxy in order to carry out various missions for their cause. These missions can range from guerrilla attacks on Imperial planets, weakening your opponent’s grip on key locations, to displays of might from the Empire that bring planets more completely to heel. All these missions are carried out with your faction’s ultimate aim in mind. 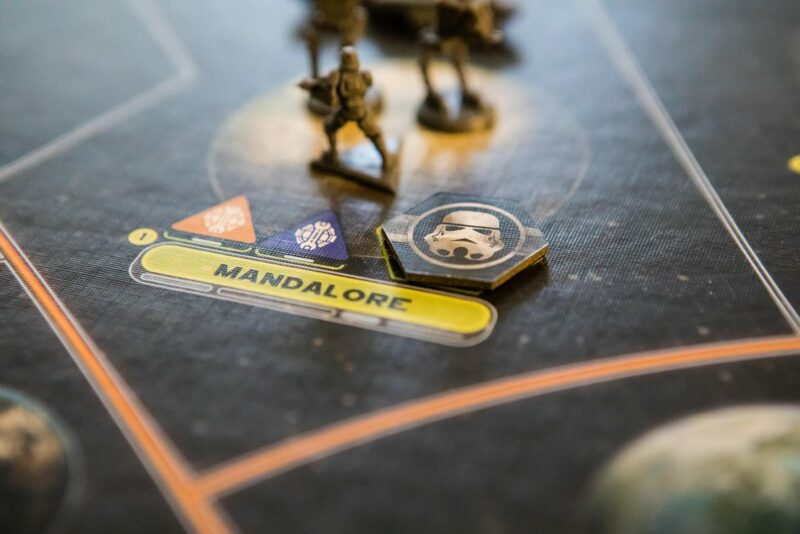 If you’re the Empire, you want nothing more than to uncover the Rebellion’s secret base, hidden somewhere on the board, and destroy it, winning the game in the process. For the rebels, it boils down to simply surviving. Success here is a case of playing hide and seek, gradually garnering support for your uprising and avoiding detection long enough to run down the clock, at which point the population presumably decides enough is enough and widespread revolt becomes inevitable. This asymmetry, along with the hidden base mechanic, defines the game and in all honesty, it’s where Star Wars Rebellion truly shines. It’s the beating heart from which each side’s personality springs, resulting in an experience that’s both compelling and highly thematic. Han does something dashing next to an AT-ST as Darth Vader and the Emperor look on. How much more theme do you want? Palpatine, Vader and the rest of the gang are giants trying to crush an ant. Their military is vastly superior, leading to fleets of TIE fighters and battalions of stormtroopers spreading out across the board trying to uncover the rebel scum. The rebels, by contrast, feel constantly on the back foot – continually outgunned and always keeping one eye on where they might need to run to next. It’s no coincidence that one of the missions always available to Leia and the gang is essentially ‘leg it’, or ‘make like a tree and get off Hoth’. The opening rounds present each side with a multitude of options that only ramp up, along with the tension, as the game goes on. New leaders will join your side as new objectives become available, escalating the conflict – and escalating the pressure on players’ brains in the process. For aficionados of the films, many of these escalations bring the gleeful joy of fan service with them. You can send Luke for Jedi training. Perhaps you want to destroy whole planets with your Death Star. It’s an enjoyably effective story generator, coming good on its promise of remixing the main beats of the original trilogy without sacrificing flavour or depth. We all remember that scene when the walkers start breakdancing on Mandalore from the originals, right? But for all that, there are some caveats worth bearing in mind. Star Wars Rebellion is heavy. Both physically (even though there’s a lot of space in that enormous box), but more importantly, mentally. The basic flow of play is relatively simple, once you get your head round it, but there are edge cases everywhere you look. There are decks and decks and decks of cards. The combat is… unique. A gateway game, this is not. Honestly, what part of this looks complicated to you? Nor is it cheap. This isn’t the place to get into a discussion on money-to-play-time ratios, but you’re looking at splashing out £70-80 if you want to take it home. 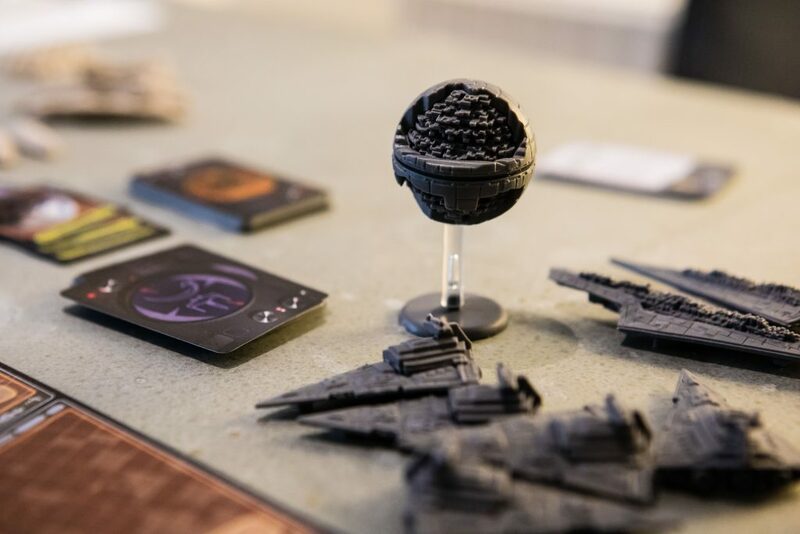 That’s a lot of disposable income for most people: Star Wars Rebellion is definitely a luxury good. 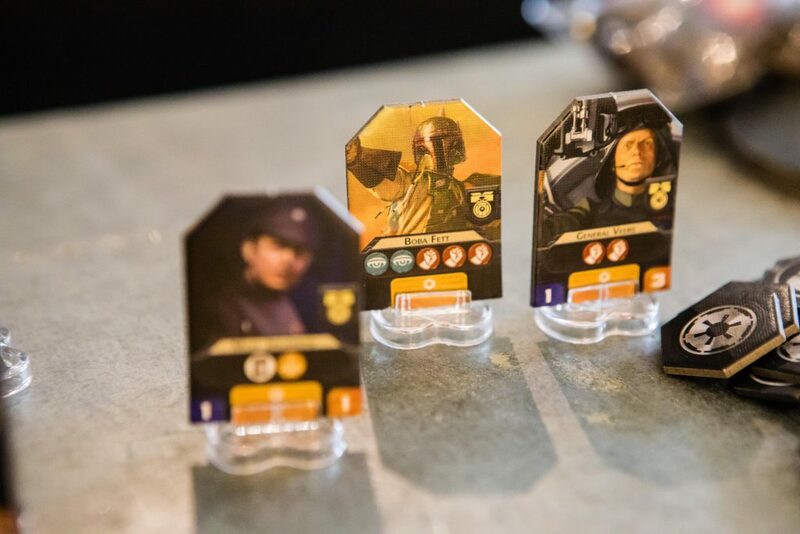 We can kid ourselves all day long about playing it as a four-player game as the box suggests is possible, but in all honesty, it feels like a sure-fire way to dilute the experience, and who’s going to do that? It’s long, too. Expect to spend upwards of four hours playing it, quite easily. Even those who aren’t prone to overthinking their moves are probably going to find themselves staring at one of their many hands of cards and painfully trying to figure out their next turn on many occasions. In hindsight, it’s probably not a game to play while drinking heavily, although where’s the fun in that? That length isn’t helped much by the combat, which is probably the most-criticised aspect of Star Wars Rebellion’s gameplay, and while we can understand why that might be, we don’t entirely share that view. It’s a fairly complex (some would say fiddly) system of dice rolling, matching the resulting damage to the right units, throwing in some card effects for an added layer of tactics, and then repeating the whole process for the next ‘theatre’ (ie, the ground battle or the one going on in the skies above). We can’t call it elegant. It’s definitely time-consuming. But in an odd way, we’d argue that it doesn’t do a bad job of capturing the feel of the movies. 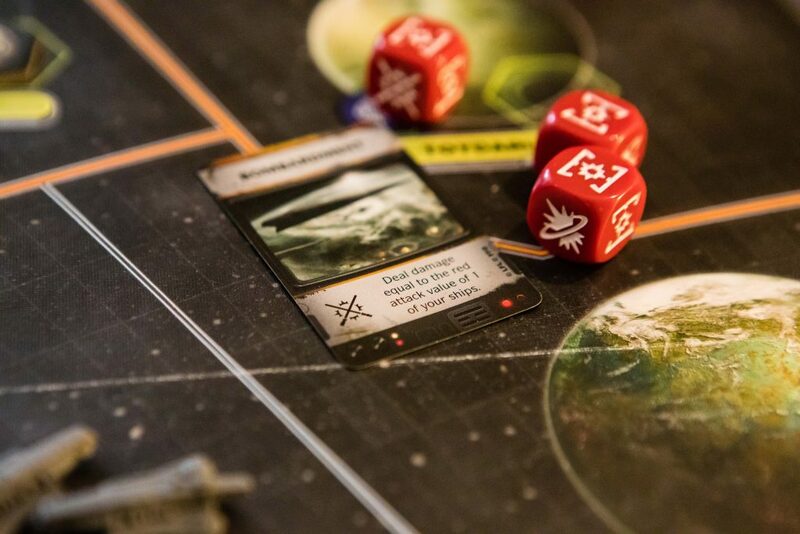 Perhaps we’re suckers for punishment, but we like rolling dice, and we also like how, with a little imagination, the system models the multi-faceted battles from the films. It’s just a shame that it slows down the game so much, and it does nothing to make the game any more accessible for people who don’t share a dice fetish. 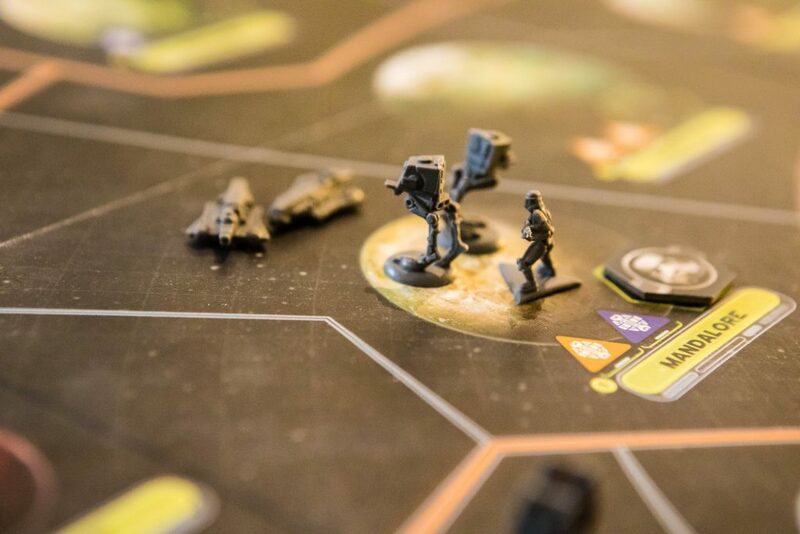 But for all these criticisms, Star Wars Rebellion is a game that stays with you long after you’ve played it. It feels so tense, so satisfying, so richly evocative that once you break it out these issues just melt away. Searching for, or trying to conceal, that hidden base is just brilliant. It’s up to you as to whether those criticisms cool the fires of your desire. For some, they’re undoubtedly going to be valid reasons to give it a miss, and it’s worth mentioning that famous brand in amongst any discussion of the game. 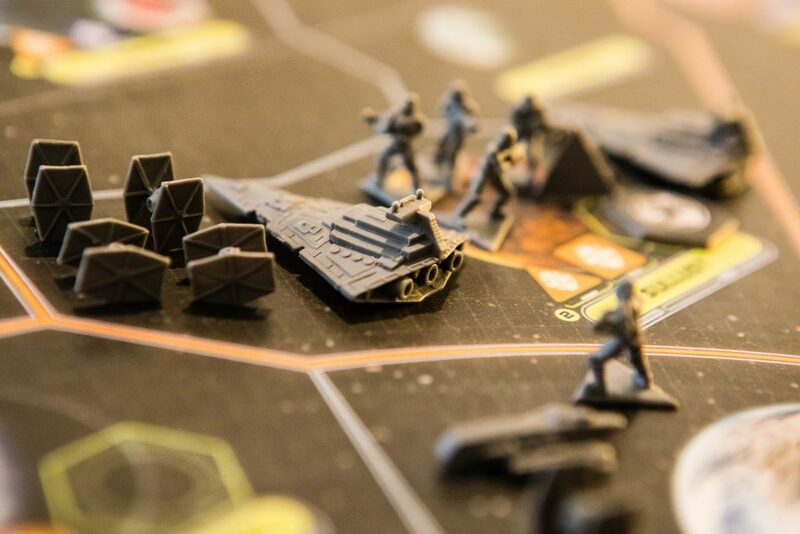 Take the theme away and the game still excels in many areas, but it’s undoubtedly a harder sell – if you’re interested purely because you love the films then there is no shortage of other excellent gaming options (many of them produced by FFG!) to help scratch that Star Wars itch. 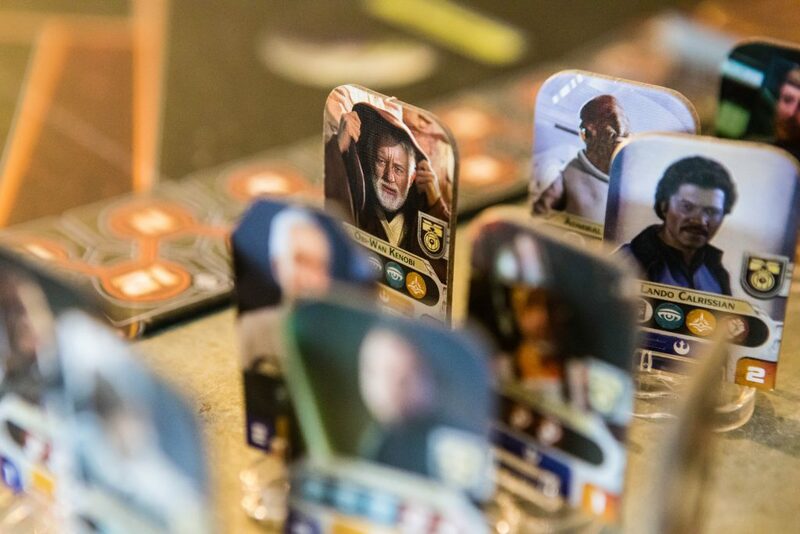 But if you love both the source material and you’re happy taking on a slow-burning board game with a fair amount of complexity, AND you have someone you think you can play this with, Star Wars Rebellion has a lot to offer. 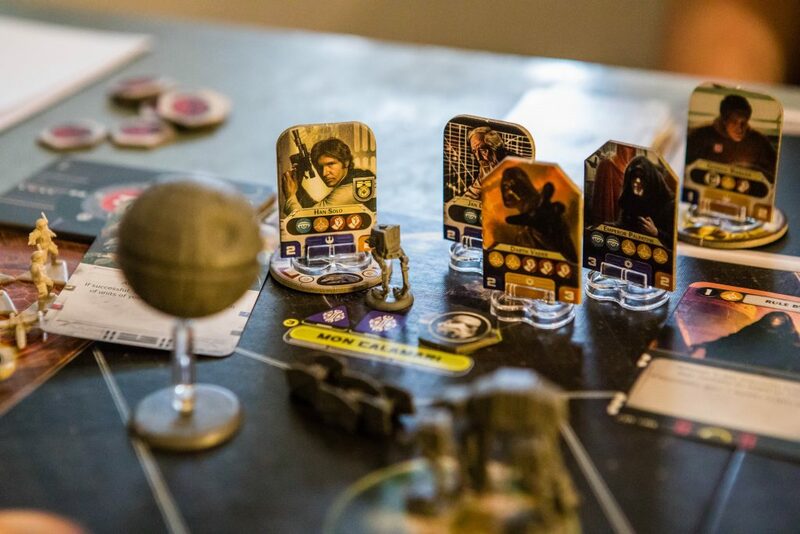 For the right audience, FFG have created a fascinating, rewarding and compelling Star Wars experience on a grand scale – and with barely a lightsabre in sight.